I know what you're thinking. Nice. But... well, seasonal. How much wear will he get out of it? Will it still fit him next year? 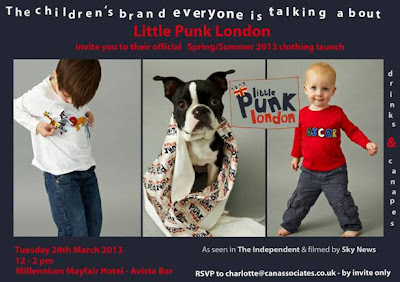 Well, with Little Punk London ('the first and only children's stick on and play designer t-shirts... hours of fun, beautiful to wear' as they themselves put it) such things don't matter. Because once Christmas was over Charlie was able merely to peel off the velcro decorations and create an entirely new look! Something he can do again and again. And so can you. Because to celebrate the launch of their brand-new range Little Punk London is offering one lucky Bringing up Charlie reader a fun item of clothing from their collection. All you have to do to win a groovy stick-and-play alphabet t-shirt is enter below and the winner will be chosen by this time next week (i.e. Tuesday 26th March). So go ahead (little) punk!